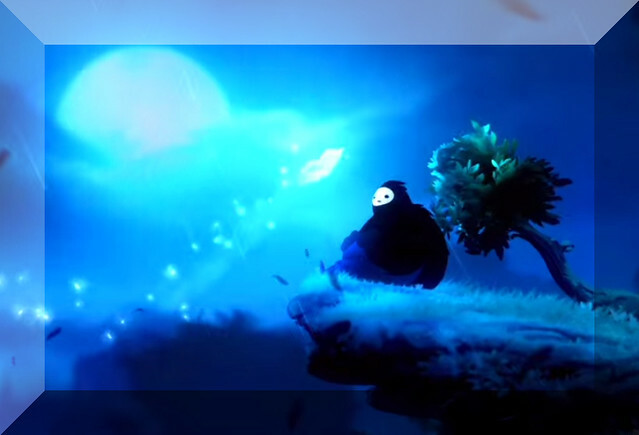 Ori and the Blind Forest | Gaming Time! It has been a stormy and rainy night while the deep voice of a tree’s spirit is telling the story of his lost child, Ori. A light coming out of the tree got blown away like a luminous white feather, making its travel to a place called – Swallows Nest -. This is when we first control a character, called Naru. A creature most similar to a bear but still quite different. 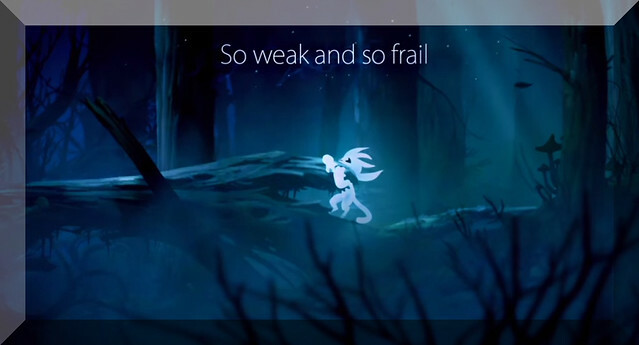 We walk with him towards the light to find Ori. He put him up, holding the little white fluffy like a baby in his arms.. 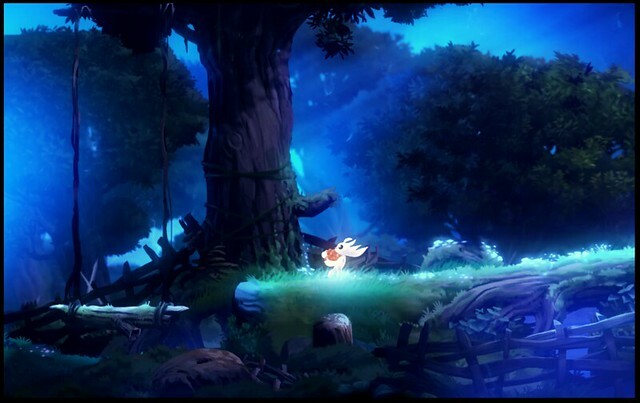 The next scene starts in a bright friendly hole, the new home for Ori. We control him now, as he is waking up at this new place. All seems comfortable, there are lights and different fruits on the ground. On a rock is a cave painting of Naru and Ori. As we go out of the cave, a bright sunny forest is awaiting us. The sky is blue, the grass is green, and we run directly towards Naru, jumping on his arms to sit on his back. Naru is shaking then a tree, as nothing comes out he marks it with a big cross on its trunk. 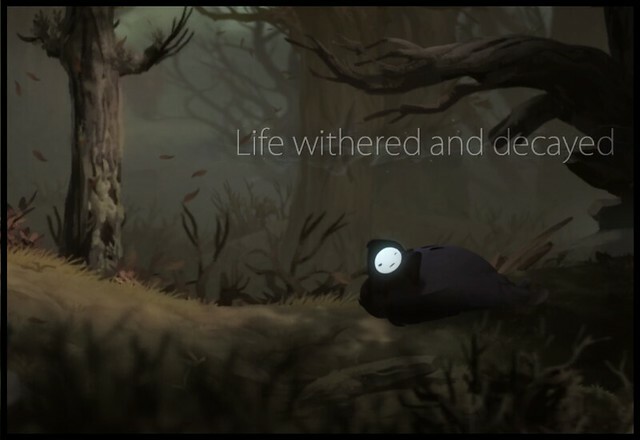 Then we keep walking (now controlling both characters at once), until we reach a river. On the other side are plenty of fruit trees, so Naru and Ori begin to build a bridge, together. They are working until it gets evening, having fun together and as a player one can really feel the binding between those two and how much they like each other. When it’s night yet, they finally reach the fruit trees on the other side, enjoying their meal. Then the old spirit of the tree starts talking again. The sky is iluminated, calling for Ori. We control him walking to from where we have been called. Then far away the light catches Oris eyes and he, standing still, is like in a ban starring in the distance, when suddenly Naru appears, running, taking him close into his arms, carrying him into their cave. Then time is passing, Naru with Ori inside the cave. As they are slowly running out of food, Naru leaves alone the cave. Outside the forest has changed, the sky is clouded, the trees seem old and dry. After a long way Naru finally finds a fruit high above in a tree. He tries to climb on it, but its branches are too dried up already, so it breaks and Naru falls back on the ground. Still hungry, without having had any success on his search for aliment, Naru returns home, picking up the last fruit on the ground, handing it over to Ori. Abit later Ori leaves the cave, wanting to get the food. And he is successful. On his way back, his memories are shown… And this was the part where I started to get tears in my eyes, incredible touching..
“An orphan once more” are the words of the old spirit telling now. 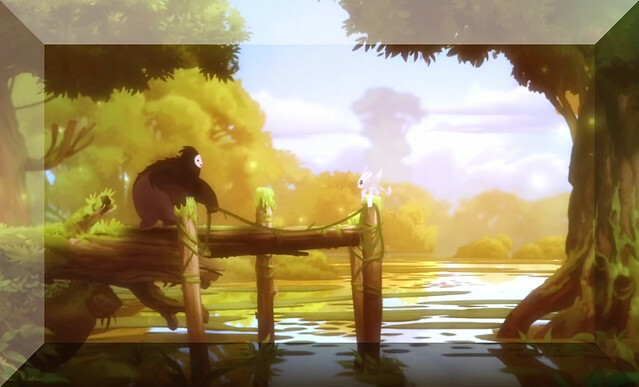 And Ori leaves his home, as he got no more reason to stay. Now we control him again, but he is moving slowly and downfallen. That he is at his limits is noticeable while playing him..
And with every single step he becomes more tired even, but one can feel the will to just keep on, uncertain about Ori’s future you want to save him. And keep going. Soon Ori can’t stay on his feet anymore.. going down on the ground.. And we keep going.. Ori crawling on all fours now..
We keep going, we want to save Ori.. but his life.. is slowly fading away..
And after his last breath taken.. bright luminous flowers appear all over the ground around his lifeless body.. Like a path they blossom their way to the old tree. Then the old voice again.. This is where the game is saved for the first time and the real adventure begins. It needed about 5-10 minutes of gameplay, then I was pretty much owned by feelings. This was so beautiful, sad, partly unbelieveable authentic. The first part seems more like an introduction. We begin our journey in the forest while the storyteller leaves every now and then an annotation. We may control 2 different characters by then, sometimes both at the same time, including us directly in the story and making us feel part of it. The intense immersion to the game makes it quite hard to occupy with taking screenshots and impossible to play in window mode. My personal opinion – this game MUST be played in fullscreen or you miss 70% of it. I don’t want to go too much into the details, to avoid spoilers, but this is my very first impression. It’s noticeable that there was put alot of afford into every single aspect. And it might be one of the unique experiences, a player who went through, probably won’t forget. 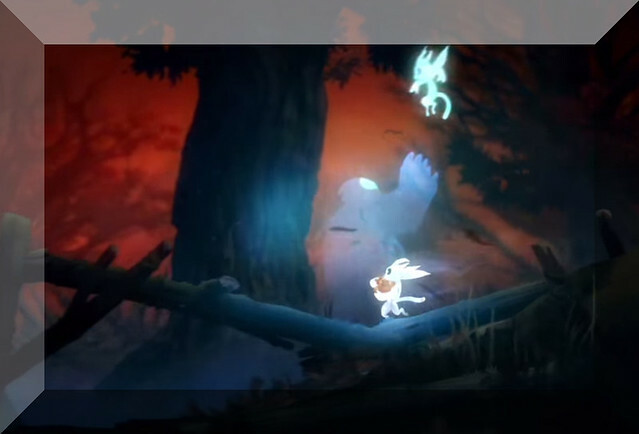 A new game just got my attention: Ori and the Blind Forest. Suggested on Steam, however I’ve read the name before. Now I will need to see if my PC can run it, it’s a 50/50 chance.